Snack Girl’s friend, Jerri, likes potatoes whatever way you serve them. Mashed, chips, baked, scalloped, or roasted he hasn’t met a potato he wouldn’t eat. I am also a fan of potatoes and believe the low-carb diets out there have given them a bad rap. Why? They aren’t the equivalent to wheat bread or cupcakes. A medium potato has 70% of your daily value of vitamin C, 12% of your daily value of magnesium, and 30% of your daily value of vitamin B-6. Yes, potatoes have carbohydrates but they also have nutrients! Now, French fries are deep-fried and deserve a bad reputation because of their fat content. Seems that when you put potatoes in oil, the potatoes soak it up and you get a fat bomb. (My book has an easy, incredibly tasty, non-fatty fry recipe – see Snack Girl To The Rescue!). They are both crunchy and soft (like a real French fry) but you miss the fatty wallop. The reason why the photo above is only 9 bites is because my children started to eat them before I could photograph the tin. The conditions I work under can be extreme. The food literally disappears before I get a chance to photograph it. I used shredded hash brown potatoes from the frozen section, and pre-grated part-skim mozzarella cheese. Am I lazy? Yes. The potatoes are already sliced and peeled (nothing is added). They only cost $2 for a 30 ounce bag so I did better than if I bought fresh potatoes. The cheese is a rip-off but what are you gonna do? Sometimes, I can’t be bothered to get out my grater. Go ahead, flame me. I made these as a half time snack for the latest round of NFL play-off games. YUM! Whats the serving size? This sounds delicious as I'm a potato-aholic myself! I love your sense of humour, snack girl! And I'd never flame you for anything you did. Keep it simple and you have more time for other things, like family. @Judi - the serving size for the nutritional facts is one bite. I would expect that you would eat more than one though. There are few things in the kitchen worse than grating cheese. I love this idea, I am getting prepared to start my freezer meals and this would be a great addition to breakfast! These look very good. My only issue is that I do NOT like washing muffin tins. (and I wash A LOT of dishes!) So I will use a large cookie scoop and bake them on a parchment lined cookie sheet.Thank you. I save many of your recipes to try one day, but this one I will definitely be trying soon. 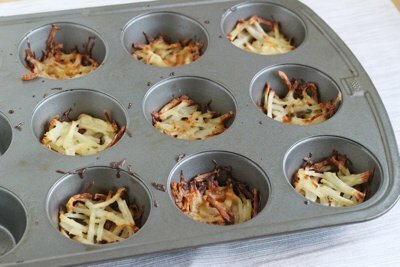 I think my kids would really like it, and the hashbrowns make it so easy. My kids love baked potato wedges, but some days, sadly, I'm too rushed to wash and cut the potatoes. I often use frozen hashbrowns for an easy baked frittata but haven't tried them for something like this. Oh Snack Girl - you are so funny; I literally laughed out loud as I read this post! This recipe sounds great - will give it a try. Thanks! I can't wait to try these! I know my kiddos will love them. I suppose I could try different cheeses too like cheddar or pepper jack! These look delicious and easy to make! My kids will love them. We all love potatoes but I don't seem to make them often. Thanks a bunch! 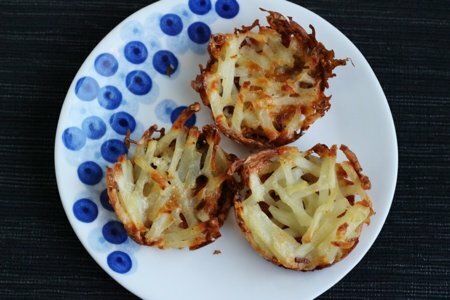 I will go to the store today and get the frozen hash browns for this recipe! My son does not like any kind of potato unless it is a french fry but I think he would like these. I love the fact that they seem so easy. I am a lazy cook and only try new things if they have few ingredients and little prep time! Thanks for another great recipe! Is shredded mozz cheese the same as grated?? @Heather - yes, it is the same. I believe you are right that they call the packaged cheese - shredded cheese. These would be tasty with an egg cooked on top of the muffin fries . Dear Snackgirl Ihave just read your lowfat hashbrown and cheese recipe and I thought that I would let you know that here in Europe there is a French manufacturer of kitchen equipment called Tefal. They make an amazing item that cooks chips, roast potatoes and wedges etc and all you add to the potatoes is one teaspoon (is that an American measurement?) of oil and set the times for about 30 minutes (variable to how brown you like the chips (French-fries, not what we call crisps) and the machine beeps at the end and you have really good chips. You can add flavourings to the potatoes before you start cooking, although I have never added cheese. I do not know whether this is available in the US, but it's a real quick and easy and not too messy solution. (One teaspoon is the equivalent of one quarter tablespoon)There are recipes in the manual too. I love potatoes too but they digest into sugar immediately driving up blood sugar which may lead to a sugar spike then crash unless . . . combined with fats and proteins. Cheese, bacon, hamburger, chorizo, or pepitas will all combine to make this a healthier recipe. The fats and proteins help to slow digestion and keep blood sugar more balanced. Even if one is not diabetic one could still benefit from balanced blood sugar. How about making a couple of these with the mentioned additions a meal? It would be small, filling and stick with ya for awhile! Love your blog and email updates. Thanks for all your yummy real world ideas. I read somewhere that potatos lose a lot of their nutritional value when frozen and that it's almost like a totally different food. It was in a book my daughter's friend received as a gift. I'll have to find it and send you a link. I'm not sure if it's true, but it would be a reason to use real potatos rather than the frozen prepared stuff. These look awesome! High in Vitamin C and A, calcium, folate, B6 and beta-carotene. Sweet potatoes have it all over white potatoes. I made these last night and they were great! It was a bit too much salt for us, so I'll cut back next time. And they stuck to the pan, which was no fun to clean up. So I might try Debbie's suggestion and put lumps on a parchment-lined sheet, or even just one big lump that I cut into wedges after baking. Anyway, they were yummy, and a big hit with the kids. These look great! Could you bake and then freeze them for later?